If you've sent your resume and cover letter (or any other form of job application) to an employer and haven't heard back, consider sending a follow-up email. 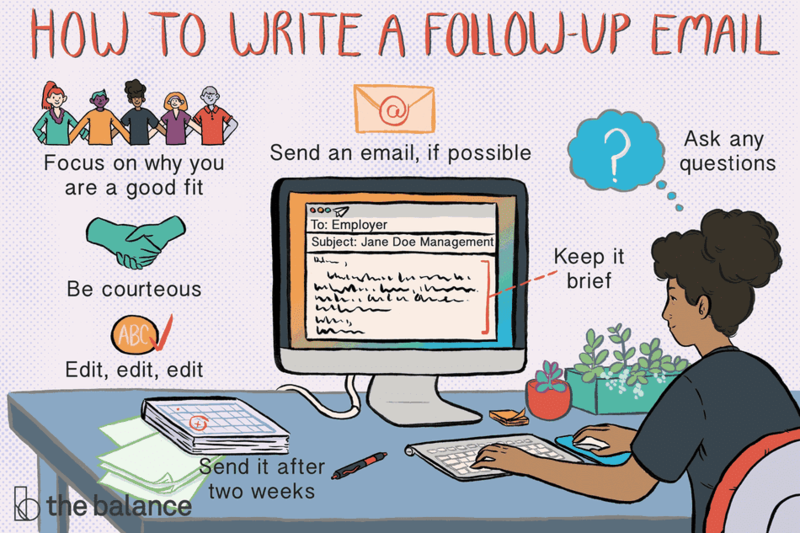 You can also follow up with an email message if you don't hear back after a job interview. Unfortunately, employers don't always keep applicants informed about the status of their application. Therefore you may need to reach out to determine your status. If done strategically, following up can be a great way to reinforce why you are qualified for the job, and can even get your application a closer look. An email is a quick and efficient way to reach out to the employer. A mailed letter might take too long: an employer might make a hiring decision in that time. A phone call is another option, but you may not be able to get contact information for the hiring manager. However you choose to reach out, make sure you are polished, professional, and polite. Send it after two weeks. If you haven't heard back from the employer two weeks after sending your resume and cover letter, consider sending an email. Don’t send it any earlier. You want to give the employer enough time to read and respond to your application. Send an email, if possible. Employers typically prefer receiving this kind of message by email; it allows them to keep a record of your contact, and they can respond quickly. However, if you need an even quicker response (say, for example, you know they are supposed to make a hiring decision very soon), you can try reaching out to the employer by phone. Use a clear subject line. In the subject line, include the title of the job you are applying for and your name. This will allow the employer to know exactly what the email is about right away. Be courteous. You want to be as polite and professional as possible in your email. Begin with a polite salutation and use the employer or hiring manager’s name if you have it. Begin the email by thanking the employer for taking the time to look at and consider your resume. Keep it brief. Don’t write an extremely long email. Keep it brief so that the employer can quickly skim it and understand your purpose. Focus on why you are a good fit. Briefly remind the employer why you are a good fit for the job. If you have any new information you want to share (such as a new achievement at work), you might mention that here. Ask any questions. If you have any questions related to the job or the application process, you can ask them at the end of the email. Mention a visit. If you live far away, you might want to mention a time when you will be visiting the area and are available to meet. Review and Edit. This email is another opportunity to make a good first impression on the employer. Make sure your email is professional and thoroughly edited. It is a good idea to review email examples and/or templates before writing your follow-up email. Along with helping with your layout, examples can help you to see what kind of content you should include in your document. While examples, templates, and guidelines are a great starting point to your letter, you should always tailor your email to fit the particular job you are applying for. Review an example of an email message to use when you have not heard back after sending a resume and cover letter to an employer. I hope you are well. I submitted a resume earlier this month for the programmer position advertised in the Times Union. I am very interested in working at XYZ Company and I believe that my skills, especially my extensive C++ experience at ABC Company, would be an excellent match for this position. If necessary, I would be glad to resend my resume or to provide any further information you might need regarding my candidacy. I can be reached at 555-555-5555 or jdoe@abcd.com. I look forward to hearing from you. If you send your message and do not hear back after a week or so, you can try contacting the employer again. Rather than sending multiple email messages, if you can locate a contact person and phone number you may want to try to follow up with a phone call. You can also follow up with a phone call if the hiring manager doesn't get back to you after a job interview. However, if you hear nothing back after this, it is best to start thinking about the next job opportunity. Don't hold up your job search waiting to hear back from a hiring manager. Keep applying and moving forward while you're waiting to hear back about interviews and job offers, so your job hunt doesn't get stalled.